China leads globally in mobile payments with WeChat Pay and Alipay leading the way. India is also witnessing growing acceptance for digital payments with Paytm and PhonePe leading the charge. 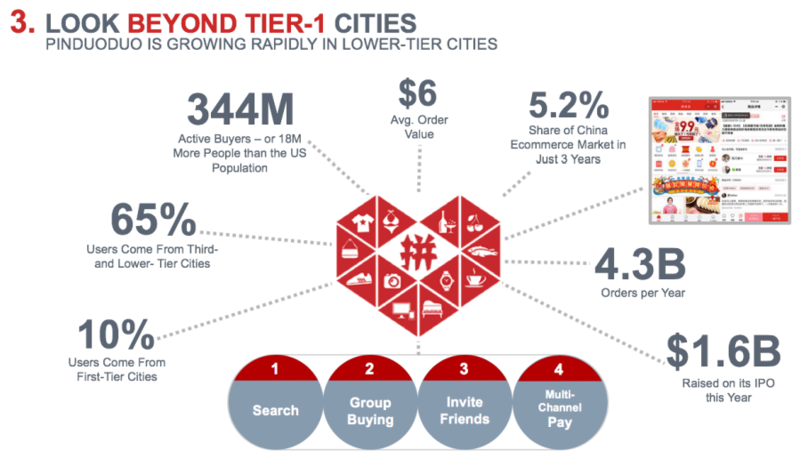 Companies in China are seeking to tap the significant opportunities that exist in non-tier 1 cities. Both markets are seeing a strong thrust by retailers to enhance the customer experience by improving delivery efficiency. Word-of-mouth shopping culture in China is a key driver, and influencer marketing is gaining in prominence in India. 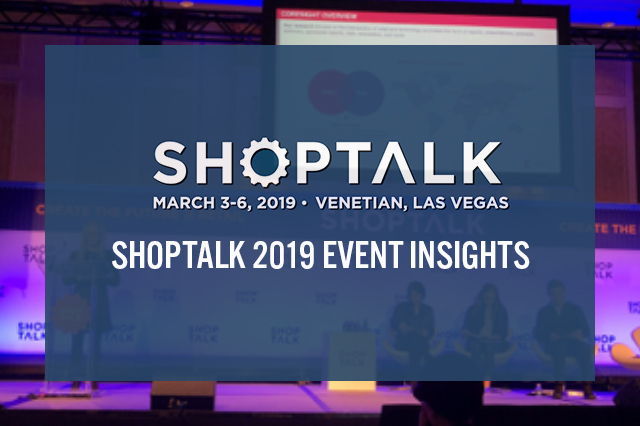 On March 3, 2019, Deborah Weinswig, CEO and Founder of Coresight Research, delivered a presentation called “Nine Things We Can Learn from China and India” at Shoptalk 2019. This report summarizes that presentation. 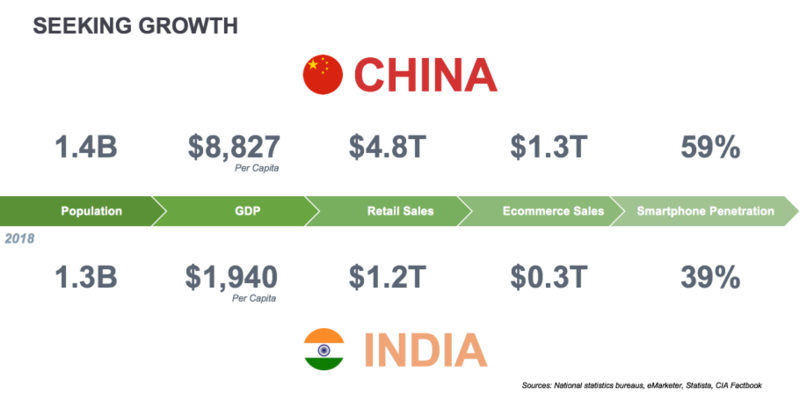 India and China are the two fastest growing large economies in the world. The IMF forecasts China’s GDP to grow 6.2% in both 2020 and 2021. There are more than 780 million smartphone users in China, more than three times the 251 million users in the US. China’s consumers are tech-savvy and browse mainly on mobile devices; India’s consumers are catching on. China’s smartphone penetration rate of 59% compares with India’s 39%. There are over 1.5 billion mobile phone subscriptions in China – more than one phone for every man, woman and child. India’s Internet ecosystem consists of over 462 million Internet users that represent roughly 35% of the population. 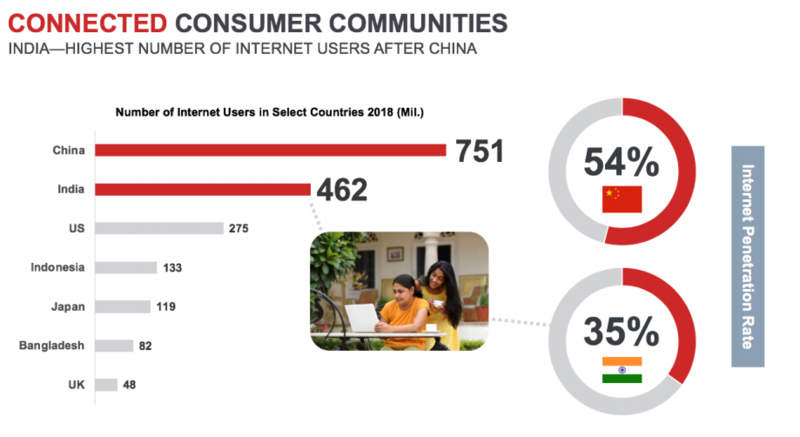 China has an Internet user base of over 751 million, roughly 54% of the population. 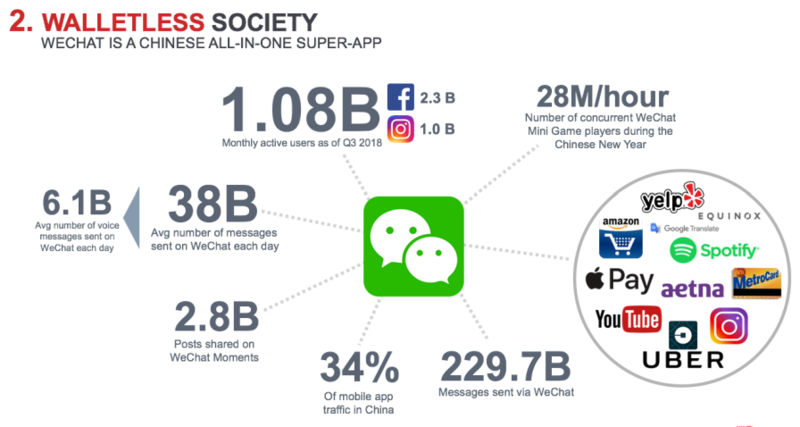 WeChat is China’s all-in-one super-app that started as an instant messaging service with social network functions. The company has since developed mini apps that run within WeChat so users can access third-party apps, such as China’s equivalent of Yelp, Apple Pay, Spotify, Uber – without exiting WeChat. Starbucks even has a WeChat mini app in addition to its own stand-alone app. In China, you need only your smartphone. Almost everything can be ordered and paid for via WeChat Pay. In the US, consumers have not (yet) adapted to mobile payments on this scale. 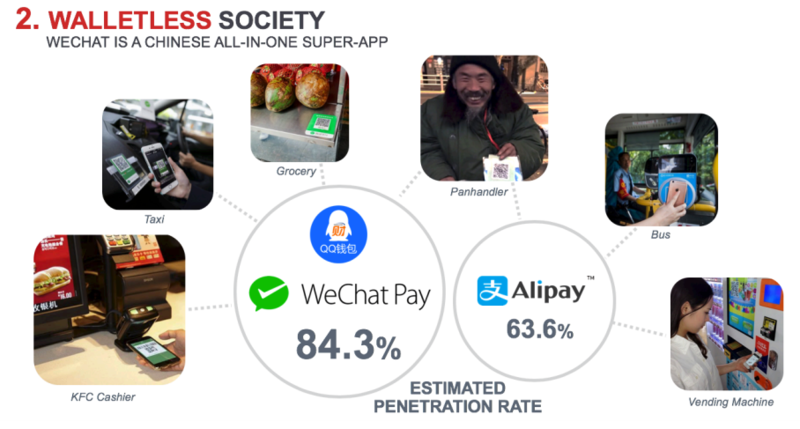 The estimated penetration rate in China for WeChat Pay is 84.3%; for Alipay, it is 63.6%. Mobile payments can be used at KFC restaurants, taxis, at grocery stores, buses, vending machines – even panhandlers accept mobile payments. 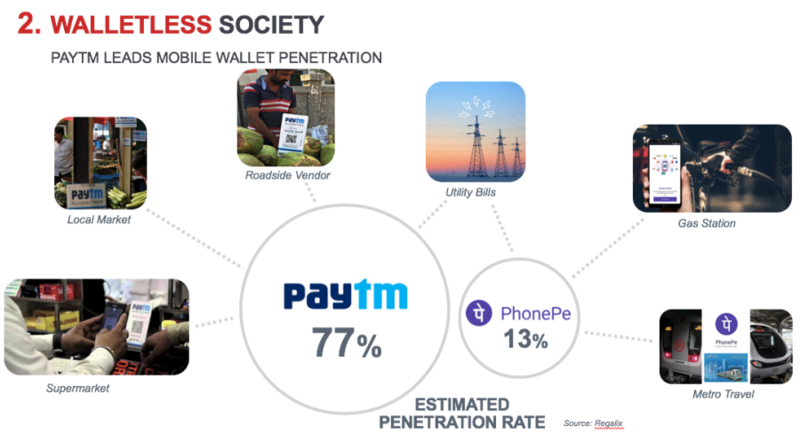 Paytm, India’s first homegrown e-commerce payments system and digital wallet, has 300 million registered users and 120 million monthly active users. At $31 billion, the company is India’s highest-funded startup. PhonePe has over 100 million users and claims to have clocked around 60 million transactions in May, 2018. 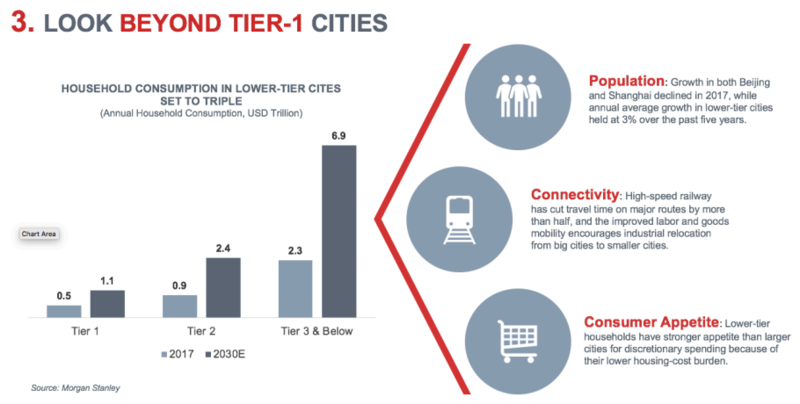 Households in tier-3 and below cities are projected to generate $6.9 trillion in annual consumer spending by 2030. 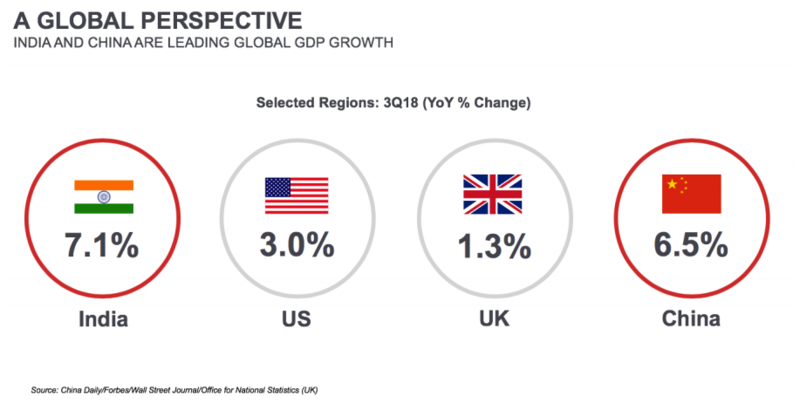 Population growth, increased connectivity and a growing consumer appetite will fuel consumption. Pinduoduo is an e-commerce platform that offers group deals for lower-end goods and encourages users to invite friends to participate for a lower price. Founded in September 15, the company is growing rapidly in lower-tier cities. The company raised $1.6 billion in its IPO in July 2018. 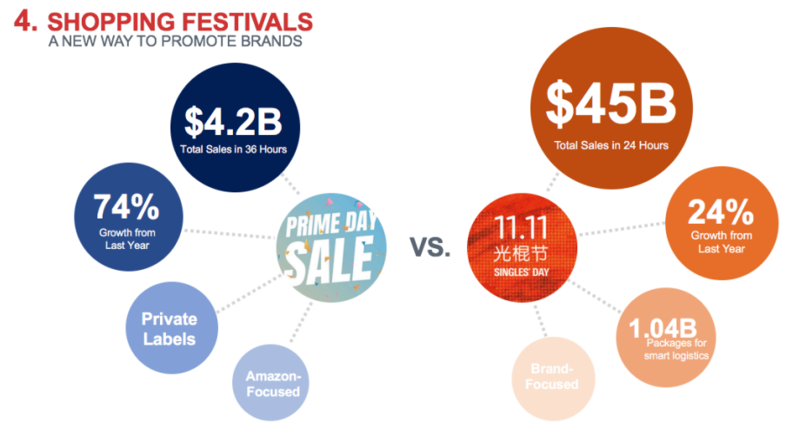 There were $45 billion total sales in 24 hours on China’s Singles’ Day (created by Alibaba) while Amazon Prime Day generated an estimated $4.2 billion total sales in 36 hours. 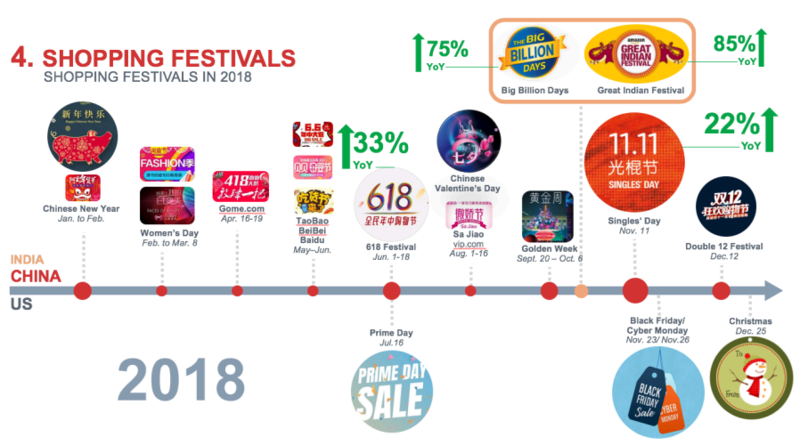 China’s Singles’ Day grew 24%, almost $8.8 billion, in 2018 over 2017, while Amazon Prime Day grew 74%, approximately $1.8 billion. There were over one billion packages delivered using smart logistics on Singles’ Day. Chinese consumers celebrate many shopping festivals: Nine shopping festivals in China compared to three in the US last year. In India, online retail during Flipkart’s five-day Big Billion Days sale period (which coincided with Amazon’s Great Indian Festival sale period) grew over 60% to $2.3 billion. Coresight Research expects to see more shopping events that will give retailers and brands opportunities to create special products and drive consumer engagement. China’s companies focus on delivery services. 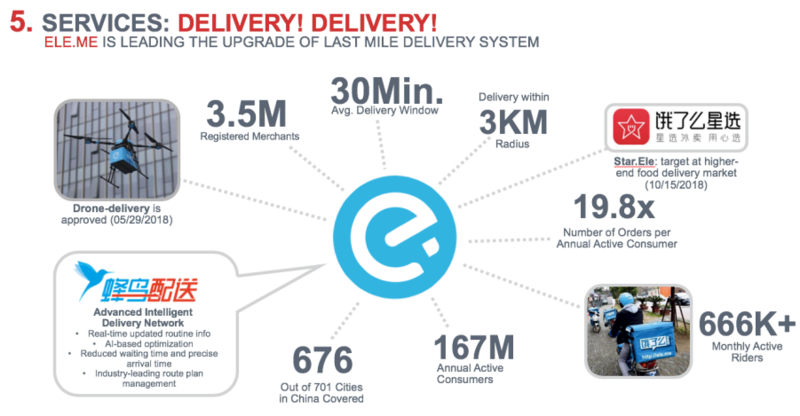 Ele.me, a food ordering and delivery platform, is leading the upgrade of last mile delivery in China. me is building an advanced intelligent delivery network to increase efficiency. Indian food ordering and delivery platform Swiggy recently acqui-hired artificial intelligence startup Kint.io with the objective of leveraging object recognition technology to enable customers to discover restaurants using images and recommendations based on image search. 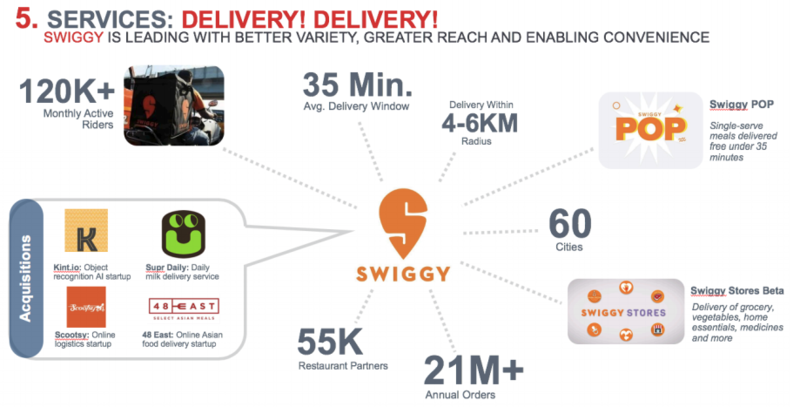 Swiggy also acquired Mumbai-based on-demand delivery startup Scootsy in August 2018, with a view to strengthening its delivery network and expanding its customer base. Amazon and Flipkart have leveraged the presence of thousands of kiranas (small neighborhood retail stores) that dot India’s retail landscape for last mile delivery. E-retailers in India consider tie-ups with the kiranas to be a cost-effective way to secure delivery capabilities in small and remote towns. Quality assurance and fresh, safe food fosters loyalty. 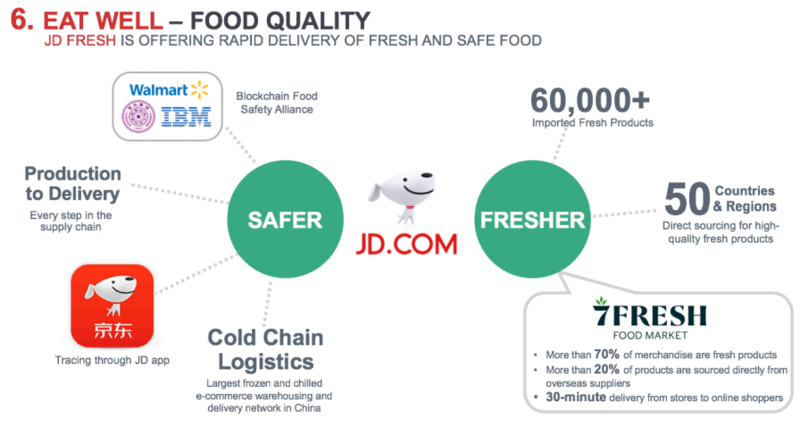 com offers rapid delivery of fresh and safe food, as does Alibaba’s Freshippo (formerly called Hema). The company is expanding its 7Fresh Food Market, which offers 30-minute delivery of online food orders. There is a growing trend toward wellness in urban India with a rising class of consumers who are willing to pay higher prices for healthier food choices. 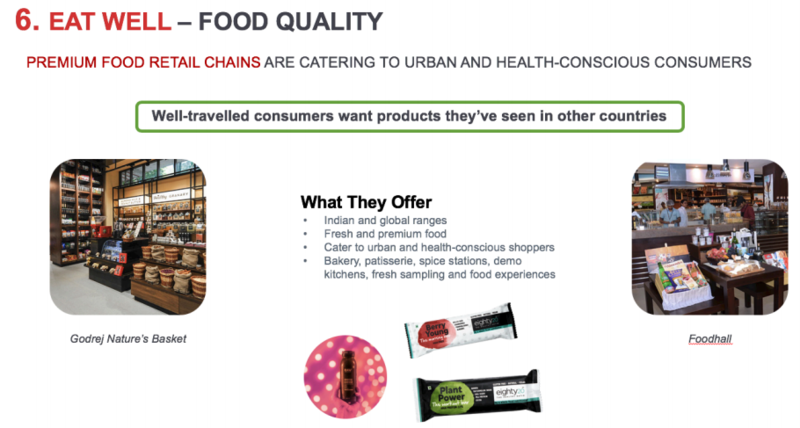 Godrej Nature’s Basket, an Indian grocery and fresh food store, offers high-quality, fresh and premium food products in its key markets such as Mumbai, Pune and Bangalore, primarily targeting health-conscious urban consumers. 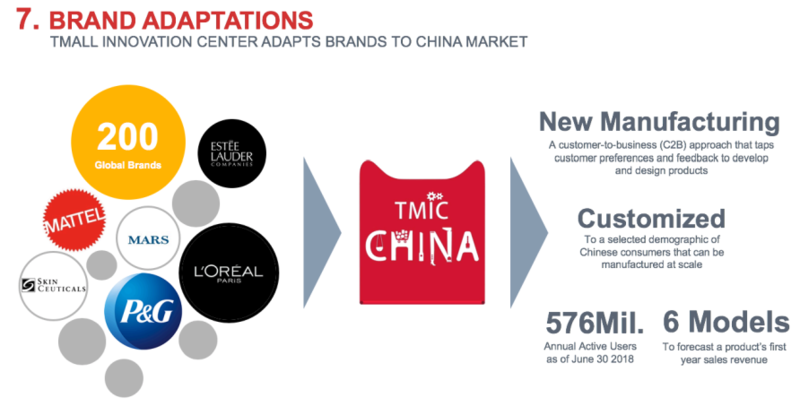 TMall Innovation Center (TMIC) is helping brands adapt to China’s consumers. 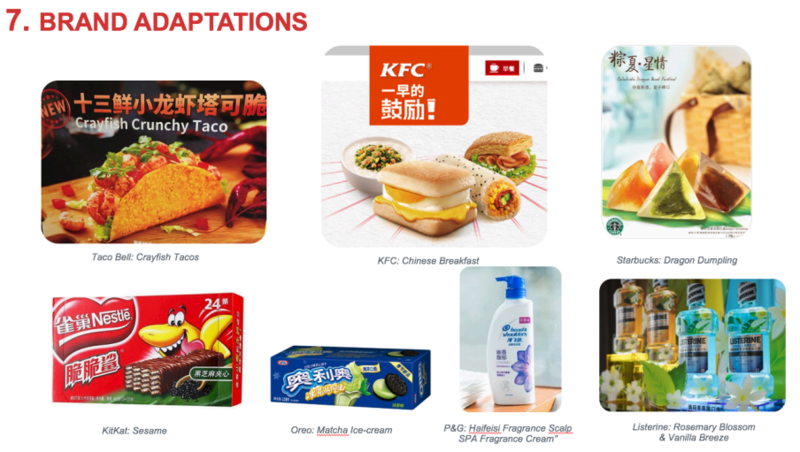 TMIC can identify elements such as flavor and smell favored by Chinese consumers and use that for product development. For example, advised by TMIC, Mars Wrigley Confectionary developed a spicy Snickers bar – and sales surpassed $1.4 million in the first eight months. Jimmy Choo launched a capsule collection that was exclusively available in boutiques in India for the Diwali festival in 2017. Christian Louboutin teamed up with Indian couture designer Sabyasachi Mukherjee for a limited-edition capsule collection of women’s and men’s shoes with Indian fabrics and embroidery. McDonald’s and Dominos, among others, have adapted parts of their menus to cater to local tastes. Amazon launched a Hindi mobile app and mobile website for Android users in September 2018. 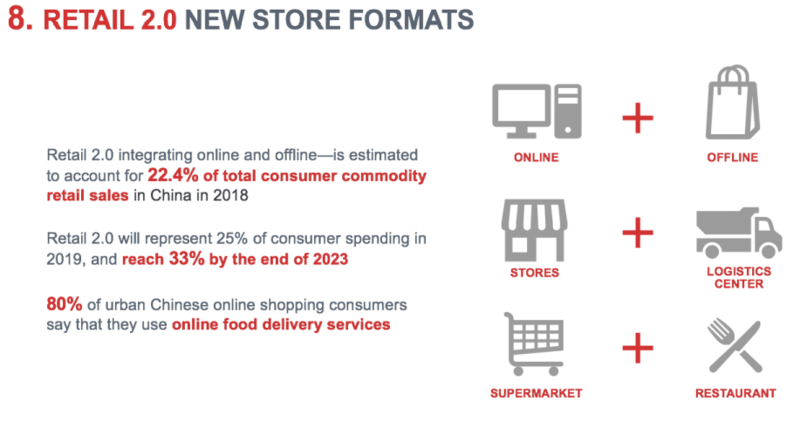 Retail 2.0 will involve a combination of six elements: online and offline, stores and logistics centers, supermarkets and restaurants. Companies such as Alibaba and JD.com are acquiring brands, retailers and retail tech to expand their reach. 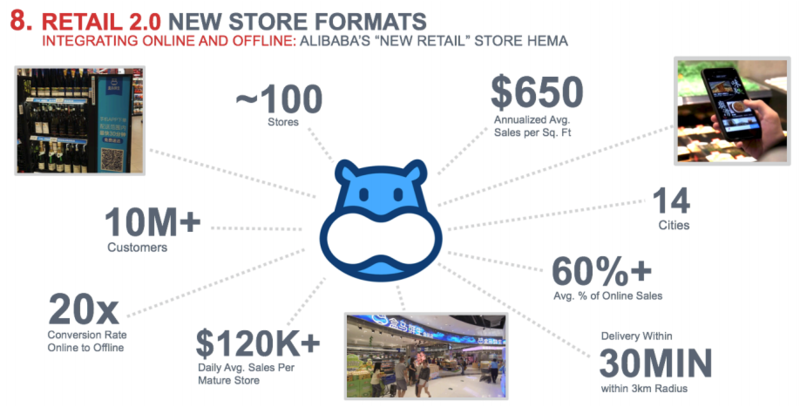 Alibaba’s New Retail store Freshippo is a typical example of integrating online and offline. Successful integration leads to a 20 times conversion rate online to offline. Customers can order food in store and online using an app from Freshippo. Large vending machines that customers can walk into. Image recognition and radio-frequency identification applications for unstaffed stores. Frictionless retail saves consumers time and removes frustration by eliminating long checkout lines. New formats such as unstaffed stores are still a relatively new concept in India: The first one, called Watasale, was developed by Nayasale Retail based in Kochi. Perpule, a self-checkout product for retail outlets, allows users to scan products at select retailers and pay for them through the app. 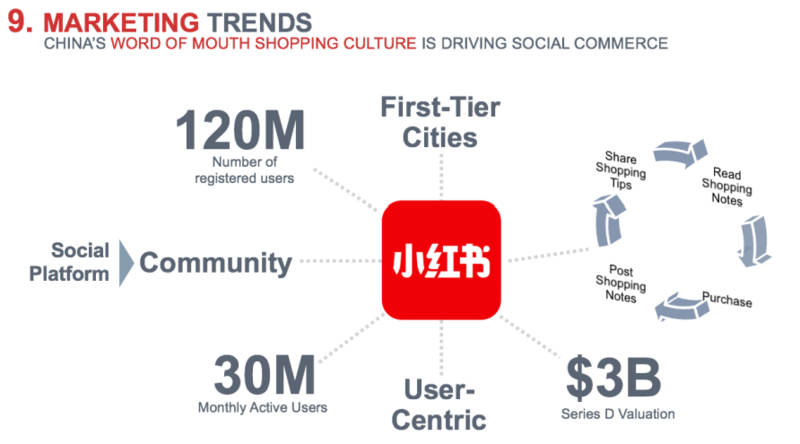 China’s word-of-mouth shopping culture is driving social commerce and creating communities. Founded in 2013, Red (Xiaohongshu) is a leader in user-centric social media and e-commerce platforms on which consumers can share and read other people’s shopping notes and tips. As Indian brands strive to expand their reach and improve engagement, more companies are adopting social media influencers as critical components of their marketing campaigns. According to data from Buzzoka Influencer Marketing Outlook 2019, more than two-thirds of branding companies spend at least $50,000 on influencer campaigns every year per brand.